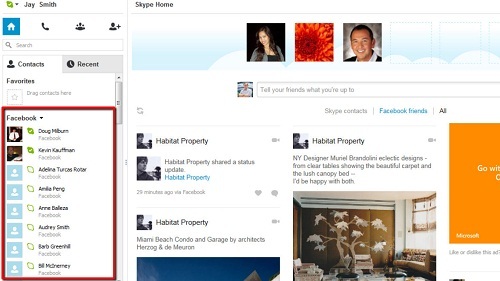 In this tutorial you are going to learn how to connect skype and facebook accounts. Load the Skype application and make sure you are signed in. Visit the “Home” screen by clicking the icon that looks like a house (if you are not already there). Make sure you can see your contacts and above these click on the “All” button with the small arrow next to it. In the menu that appears click on “Facebook”. Click the “Connect to Facebook” button and on the right a log on page will appear. Enter your Facebook details here. Once logged in click on the “Log In With Facebook” button on the right, then click “Allow” in the bottom right of the frame. 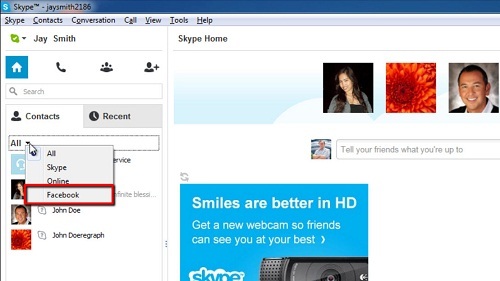 You will see that your Facebook contacts will now appear in the Skype contacts bar on the left and that is how to connect skype and facebook accounts.